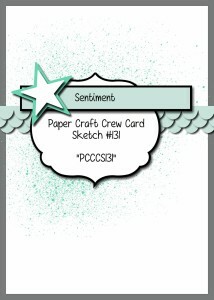 I’m back with another card for the Paper Craft Crew – this is for sketch challenge #131 (otherwise known as PCCCS131). As I’ve said before, I’m really enjoying these challenges; I’ve entered now in several Paper Craft Crew challenge, and recently entered a Watercooler Challenge. You can see (and vote for) my card in the PCCCS130 HERE – voting is only open until Monday, Feb. 16th, so if you like my card, I’d appreciate your vote! My card for the Watercooler Challenge can be seen HERE on the Watercooler Challenge blog; there’s no external voting, but you can still see my card, and the other great submissions plus the cards made by the great design team. I love the stamp set I chose; it’s called Choose Happiness, and it’s in the Annual Catalogue, available in wood or clear mount. First I die cut the shape from Very Vanilla card stock, using the Labels Collection Framelits with the Big Shot, then stamped the flowers in Strawberry Slush ink and leaves in Old Olive ink. I used the masking technique so that I could stamp the images more than once, without muddying them up. I then used the Pink Pirouette Blendabilities markers to colour in the flowers, and the Old Olive Blendabilities for the leaves. My Crumb Cake Stampin’ Write Marker was used for the branches. To create the shading around the images, I lightly traced around them using a Soft Sky marker, then went over that with my Chalk Marker. The bird image was stamped in Soft Suede on a scrap piece of Very Vanilla card stock, and hand cut it with my Paper Snips. I used the large ‘splatter’ stamp from the Gorgeous Grunge stamp set and stamped random spots in Crumb Cake ink across the Crumb Cake card base. Using the Big Shot & Striped Scalloped Thinlit, I die cut the scallops in Soft Sky card stock, and layered them just above the 1/2 way line on the card base, using my 2 Way Glue Pen – it’s much less messy than the Tombow Glue for these skinny pieces! I then took a piece of the Neutral 5/8″ Chevron Ribbon, flipped it over, and layered it along the bottom of the scallops. 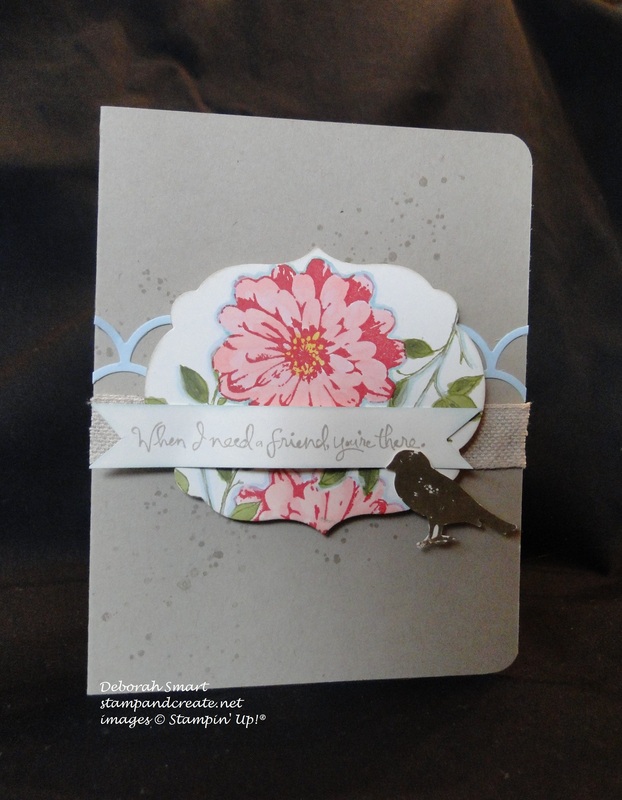 The stamped image was then layered on top of the scallops with Stampin’ Dimensionals. I stamped the sentiment in Crumb Cake ink onto Very Vanilla card stock, cut banner tails on both ends, and again used Dimensionals to attach it to the panel. Finally , more Dimensionals to attach the bird silhouette, and my card was complete. So you can see I kept to the format of the sketch, just flipped upside down. To purchase the supplies I used to make this card, just click on the image(s) below, and you’ll be taken directly to my online store. Or, you can give me a call or send an email, and I’ll be happy to submit your order for you. Thank you for stopping by today; if you have time, I hope you’ll leave a comment, and let me know if you’re enjoying my challenge cards. And if you’ve already voted for my cards – thank you very much!! Your support means a lot to me! Please remember to check out my schedule of classes & events – I hope that you’ll be able to attend a class or my upcoming party, if you’re in the area. Previous Previous post: Thank You – I was a Top 3 Pick! Next Next post: Creation Station Blog Tour – Birthday Celebrations! Oooooh, I just LOVE this card!! I think it’s my favorite so far! Thanks for all the details, Deb! Really pretty card! I love the rounded corners! Thank you for joining the Paper Craft Crew this week. 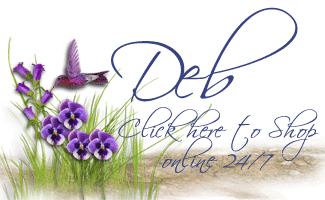 Deb, I love the seeming simplicity of your card. Its elegance is in the layers and the thought you’ve put behind that simplicity. Cutting out the bird and having it just off to the bottom right is perfect. Thanks for joining us this week for the Paper Craft Crew challenge. Gorgeous card and I love your flower. Simple yet so elegant. Thanks for playing along with the Paper Craft Crew! I just love the Choose Happiness stamp set – thanks for letting me play along with the Paper Craft Crew challenges, Pam! Deb, Great card, I barely got a card in for this challenge. Congratulations on winning #130. Thanks for noticing the details, Jan! 🙂 I’m so glad I found the Paper Craft Crew challenges – they’re lots of fun, and get my creativity going!